The mission of LVA-PW is to teach adults the life-changing skills of reading, writing, and speaking English that will enable them to participate and prosper in our society. 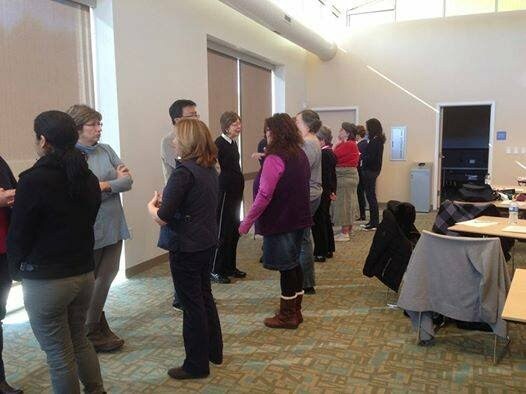 "Tutor Training Line Dialogue Activity"
Saturday, January 6th & January 20th, 2018. Call 703-670-5702 for more details on becoming a tutor and how to register. Do you Need English Classes or a Reading Tutor? It's never too late to make a new start! LVA-PW would love to help you achieve your literacy-related goals! A variety of classes for English, GED/pre-GED, citizenship, conversation, reading and writing are offered, as well as one-on-one tutoring. There is a one-time assessment fee of $50 to get started in our program. To schedule for a registration appointment, please call our office today at 703-670-5702. The LVA-PW staff looks forward to hearing from you and talking with you about how we can help you meet your goals! Are you preparing to take the citizenship exam or do you know someone who is? We have the class for you! The LVA-PW citizenship class is back by popular demand. The class will be offered on Monday evenings (starting in September) from 6:00-8:00 pm. The class has limited enrollment so contact our office today to make your registration appointment and learn more about this program. Our telephone number is 703-670-5702. LVA-PW recognized our dedicated tutors and students at the annual ice cream social and awards ceremony held September 19th at the Hillendale Fire Hall (Station 13). Over 150 people attended the annual recognition event including students, volunteer tutors, friends, families, and guests. They celebrated the hard work and achievements of everyone in the program. Student Ana Rivera and Program Coordinator Torialei Safi gave speeches about how the LVA-PW program has helped them achieve their educational goals. Five year service awards were given to volunteers Jean Cook, Lennie Fennimore, Davine Irving, Kristine Jankovits, Jayne Speck, John Sofranac, and Rodney Teixeira. Ten year service awards were presented to Judith Bugbee, Angelique Culp, Ken Ikeda, Martha Kobliska, and Joe Schu. Twenty year service award was presented to Mary Langley. Twenty-five year service award was presented to Judith Silcox. The Student of the Year award recipient was Norris Quintanilla. Tutor of the Year award recipients were Amy Feinberg and Alison Prevost. The 1st Annual Patti J. Beattie Volunteer of the Year award recipient was Patti J. Beattie. The award winners were presented with a framed certificate, acknowledging their achievements. We would like to sincerely thank all of our many sponsors, donors, supporters, volunteers and attendees who made our third annual Food for Thought fundraiser a huge success. In particular, we would like to thank our Platinum sponsors - BAE Systems, Azalea Charities and Brown’s Manassas Subaru; our Silver sponsors – Solo Flooring, Integrity Applications Incorporated (IAI), and Todos Super Market. Special thanks to First Mount Zion Baptisit Chirch Sunday School Class A3A for their support! We have too many local businesses and community leaders who purchased ads to list but greatly appreciate their support for our event. A special thanks to our outstanding Board of Directors, led by Mr. Ken Ikeda, for their many hours of hard work securing sponsors, obtaining raffle basket items, selling tickets, preparing trivia questions and for their ongoing support throughout the year. Over 30 local restaurants provided a wonderful selection of their delicious menu items. We cannot thank them enough for their contributions and for enabling all those who attended to truly enjoy a “Taste of Prince William.” In addition, we appreciate VFW Post #1503 for allowing us the use of their venue, and the volunteers from Carmax Cares for all their help during the event. Proceeds from this event will help us continue to meet the adult literacy needs of those in our community who need the ever-increasing demand for our services. If you attended, you have our sincere thanks and gratitude and we look forward to seeing you again next year. If you are just learning of this signature event, mark your calendar for early next June and plan to join us in supporting our award-winning adult literacy non-profit in serving the needs of adults and their families in our community. Please contact our office if you would like more information about our organization or would like to volunteer or make a donation. Thanks to the dedicated and tireless efforts of all our outstanding volunteers, LVA-PW was awarded the 2015 Agnes L. Colgan Community Service Award for Arts and Education by the Prince William County Chamber of Commerce at the Annual Business Awards Dinner on February 25 at the Hylton Performing Arts Center. The award is an incredible honor for our organization and demonstrates the community's support and recognition of the hard work, dedication, and commitment of each of our volunteers. All those who are part of our program are making a difference by tutoring, helping with bell-ringing and fundraisers, making donations and even just telling friends and neighbors about the great work we do to help adult learners in our community. LVA-PW has successfully met the learning needs of over 8,500 adults since our inception 24 years ago and has impacted over 30,000 family members as a result. On behalf of the staff and board of directors, thank YOU for making LVA-PW the premier adult literacy non-profit in Prince William County. We are honored to receive the award and for being recognized by the Chamber of Commerce as a community service leader. Thank you for all you do and for sharing in the continued success of our outstanding award-winning organization. The award is proudly displayed in our office. Please view the award on your next visit to our office. As part of the award, LVA-PW also received a $1,000 check and a write-up in a special EXTRA edition of the Prince William Today. Volunteers are the lifeblood of any non-profit organization and LVA-PW is fortunate to have the cream of the crop when it comes to volunteers. A number of them were able to join volunteers from other organizations all across Prince William County on May 17, 2015 at the Historic Brentsville Courthouse property to be recognized for their many hours or service to the community. Mike May, Supervisor from the Occoquan District, was the guest speaker and each volunteer received a letter of thanks and recognition from Senator Mark Warner. The presentations were followed by a picnic. It was rewarding to be part of such a dedicated group of people who are selflessly giving of their time and talents to continue to make Prince William County a fantastic community for all of us. Thanks to the generous support of The Community Foundation for Northern Virginia and United Way of the National Capital Area, LVA-PW will be able to expand its program, providing job readiness and computer skills to more adults, helping them to obtain jobs and move ahead in the workforce. Each of these organizations awarded $10,000 grants to LVA-PW, allowing us to provide even more opportunities to the over 700 adults we serve each year, empowering them through increased literacy skills. Our sincere thanks to both The Community Foundation for Northern Virginia and United Way of the National Capital Area for their confidence and support! Community and corporate support are critical to the fulfillment of the mission of every non-profit organization. Literacy Volunteers of America-Prince William is very fortunate to have dedicated and generous supporters who enable us to continue helping adults achieve their life goals through increased literacy skills. Our thanks go out to the Gannett Foundation and Northrop Grumman ECHO for their recent donations and continued support! We appreciate your commitment to education and literacy! The success of every non-profit organization is based upon the dedication and hard work of the program participants and the support they receive from the community. We have been very fortunate to have received a fantastic amount of support from individuals, corporate entities and community groups since 1991 that LVA-PW has been serving adults in Prince William County and that outpouring of support continues. With that in mind, LVA-PW wishes to thank all of the following for their generosity: The Community Foundation of Northern Virginia and United Way of the National Capital Area (of which we are a proud member) for the $10,000 grants that they each provided; The Philip L. Graham Fund for the $25,000 grant they provided for technology and software needs; and Wells Fargo and Virginia Literacy Foundation for their loyal and generous support of our program. We are also very fortunate to have the continued loyal support of the following: Prince William County Government, Northrop Grumman ECHO, NOVEC, and WalMart Store #1852 in Woodbridge, WalMart Store # 3573 in Manassas, and WalMart Store #3588 in Dumfries. Their commitment to our work and the community is wonderful and we are very grateful! These generous donors have recently been joined by other supporters of the LVA-PW mission including: S.W.I.F.T, and the Phi Kappa Zeta Sorority's local chapter. All of these groups have made significant contributions to further the mission of LVA-PW allowing us to continue with ESL, GED and Citizenship Classes as well as 1:1 tutoring and to look to the future with even more programs that will make literacy a reality in the lives of our adult learners. Many thanks to all of them! Prince William County community in an interview with Prince William County's Neabsco District Supervisor, John Jenkins. "Like" if You Support Literacy! Please "Like" us on Facebook! Click HERE to go to our facebook page! Inkjet Cartridges: Don't throw away your printer inkjet cartridges. Donate them to LVA-PW. We will recycle them and receive discounts on our office supplies. Your help is appreciated! Saturday, January 6th & January 20th 2018. In the case of inclement weather, the LVA-PW office will be closed if PWC schools are closed. Please call your tutor/student directly to determine if your class is cancelled. You can now make donations using your credit card ONLINE from the LVA-PW website by clicking the icon below! LVA-PW will be glad that you did, and SO WILL YOU! Thank you! YOU SEARCH OR SHOP...WE GIVE! Raise money for Literacy Volunteers - Prince William (Woodbridge - VA) just by searching the web and shopping online!